Sounds like I a made this up just to make you even madder about Paris? Not at all. 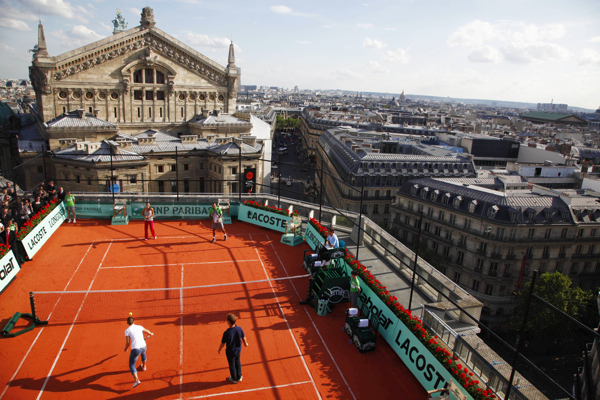 Believe it or not: a real clay tennis court has been set up on the roof of the Galeries Lafayette department store and will be there throughout the French Open tournament which started yesterday. Why don’t you just go there and hit a few balls to convince yourself? It’s for free. They even will give you the equipment, a racket and balls, and maybe you'll be one of the lucky ones to get a free lesson. 75009 Paris Open every day except on Sundays from 12 am until 6 pm, on Thursdays and Saturdays until 7:30 pm. Reservations are only possible once you’re there.